MLB 175 Count Golf Tee Jar (Regulation 2-3/4' Tees) (Select Teams Available) - $19.99 - GolfersEdgeOnline.com - Best Golf Equipment On The Web! 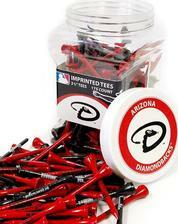 Tee up your next ball showing team spirit with the Team Golf 175 Count Golf Tee Jar. Each tee comes adorned with an imprinted team logo and team colors, proving your devotion to the team. The jar features a screw-on lid for easy access, and the label on the jar's front and lid shows your favorite team. These 2-3/4" regulation tees are perfect for any die-hard fan. If you have any more questions about the MLB 175 Count Golf Tee Jar (Regulation 2-3/4' Tees) (Select Teams Available); do not see the model you are looking for; need custom options; or prefer to not purchase online, then please call us at (630) 656-1291.